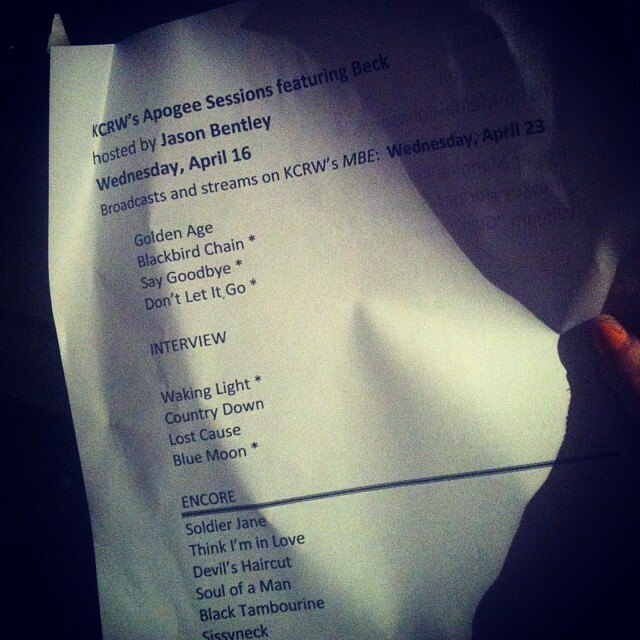 KCRW hosted a small, intimate concert with Beck tonight. It was then broadcast on KCRW's Morning Becomes Eclectic on April 23. They opened with 4 acoustic songs, did an interview with host Jason Bentley, did 4 more acoustic songs. Then there was a long rocking encore. And then put up video of the same set, plus Think I'm In Love / Soul Of A Man / Epro. You can watch that video here! Also 4 songs (Blue Moon / Black Tambourine / Blackbird Chain / Waking Light) have been released as a Spotify EP, Live From KCRW / 2014. Piano: Gus Seyffert, Roger Joseph Manning Jr.